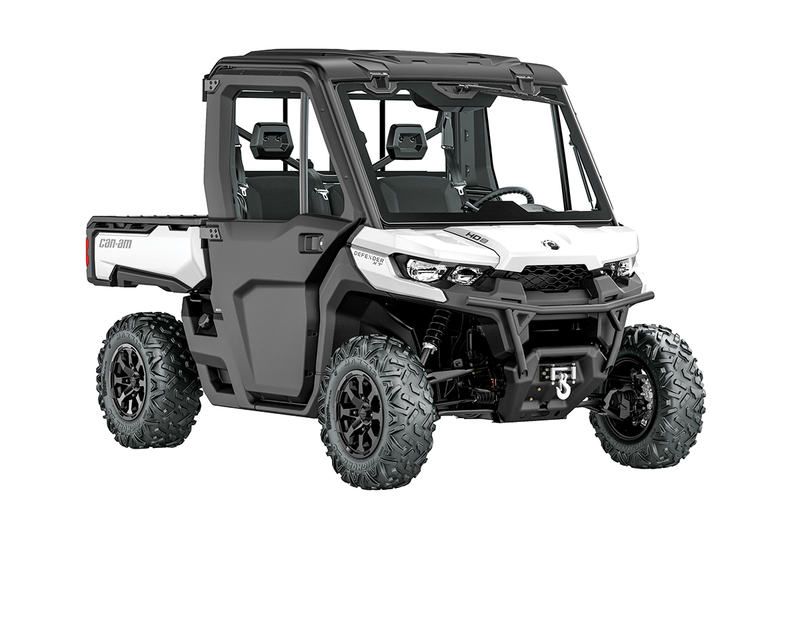 As UTV technology evolves and advances, the line between utility and recreation blurs and, in some cases, disappears. 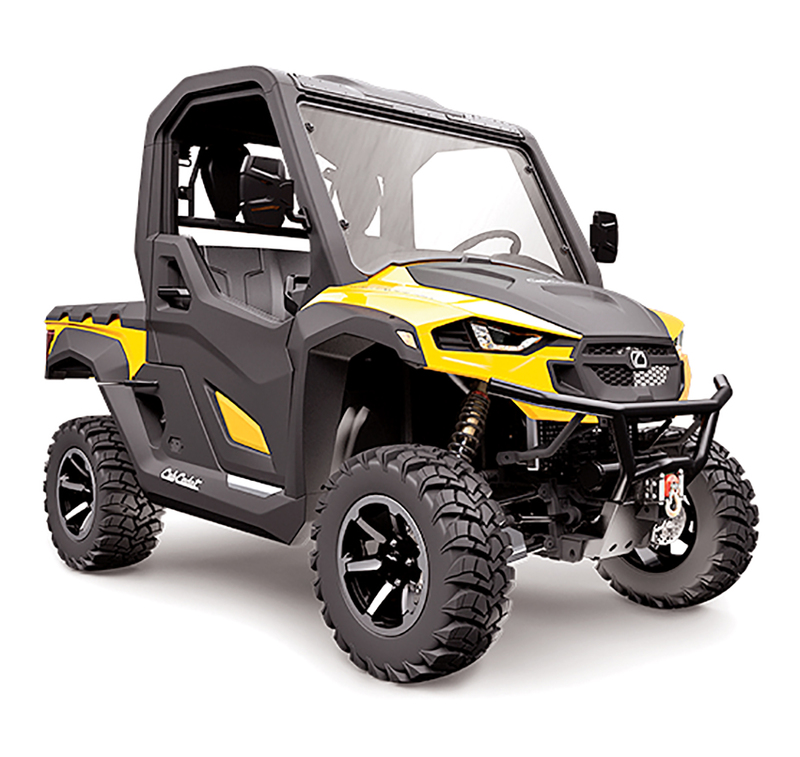 Advances in suspension and engine performance have today’s recreational UTVs attaining trail speeds and overall comfort of the sport machines of 10 or less years ago. With top speeds of 40–55+ mph, these recreational utility machines blow their 20-mph predecessors into the weeds. 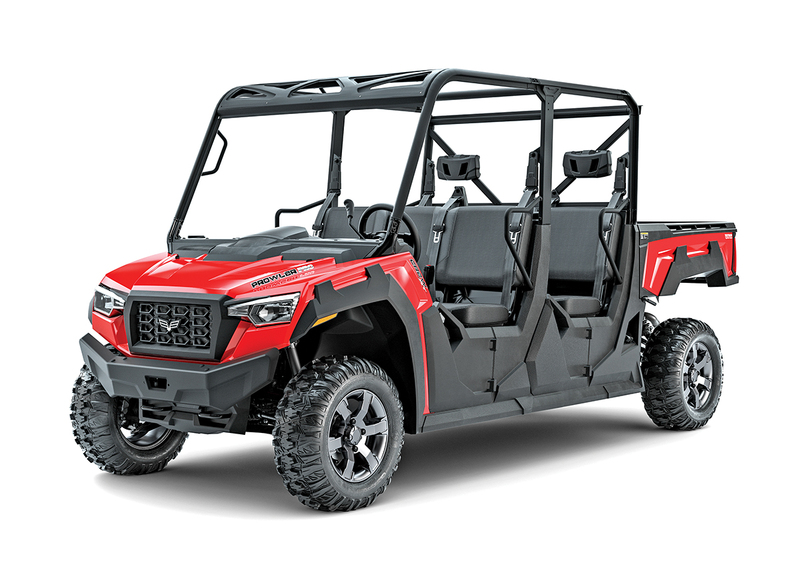 That is why we no longer include utility UTVs that can’t go faster than 25 mph, although some of today’s machines have work-site keys or other speed-limiting systems. 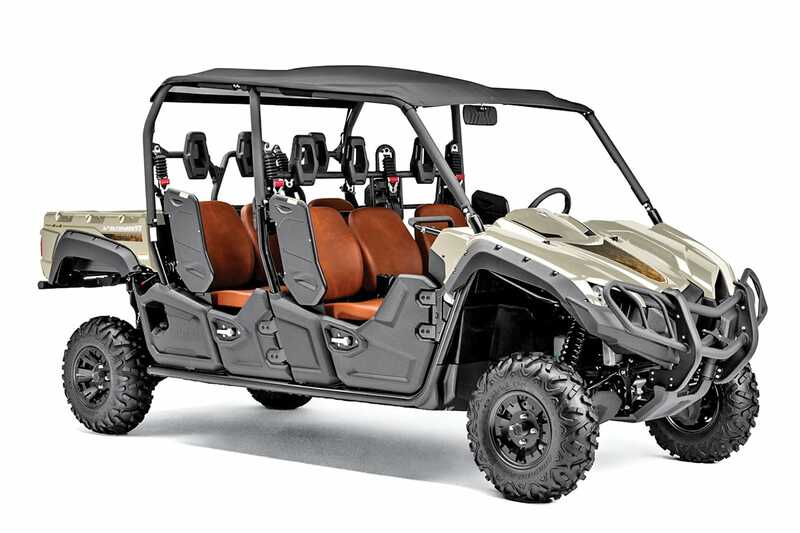 For 2019, explorers and weekend warriors alike will be impressed with all-new lines of machines like Textron’s Prowler Pro and Pro Crew, and Yamaha’s all-new Wolverine X2 and R-Spec, which replace the iconic Wolverine 700 line. 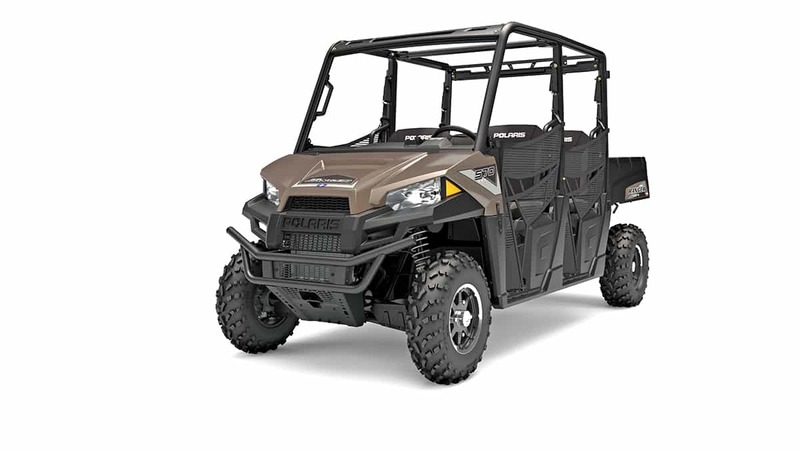 Polaris celebrates 20 years of Rangers with a 20th Anniversary Ranger XP 1000 EPS and 1000 Crew Limited Editions. 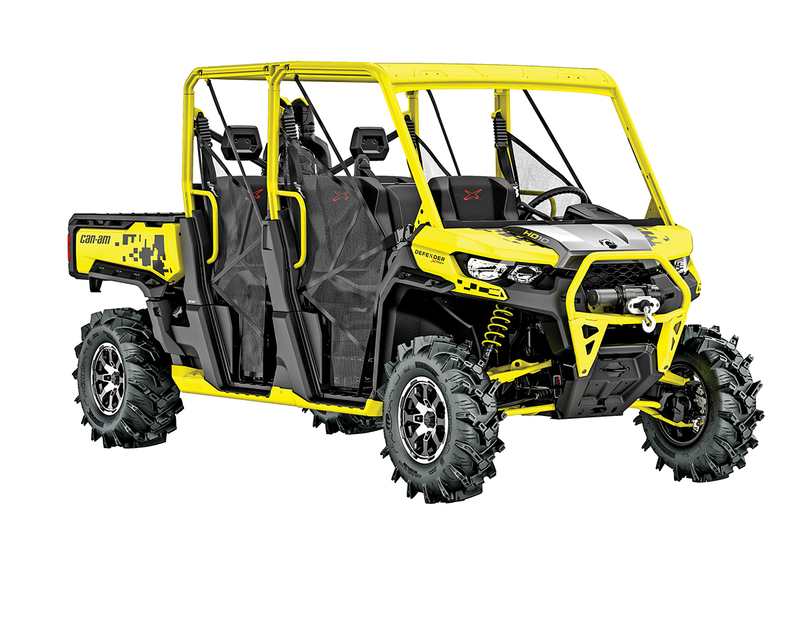 Textron also introduces the Havoc 1000 Backcountry Edition, which was introduced too late to make our 2018 guide, for 2019. 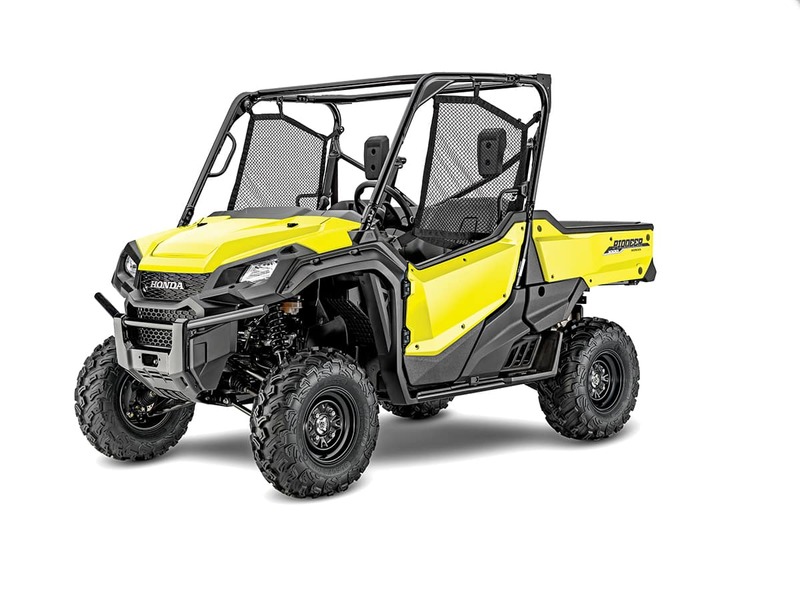 Can-Am continues with a stellar line-up of Defenders and Commanders but didn’t update them with the high-tech Smart-Lok front diff and EPS settings from Mavericks. 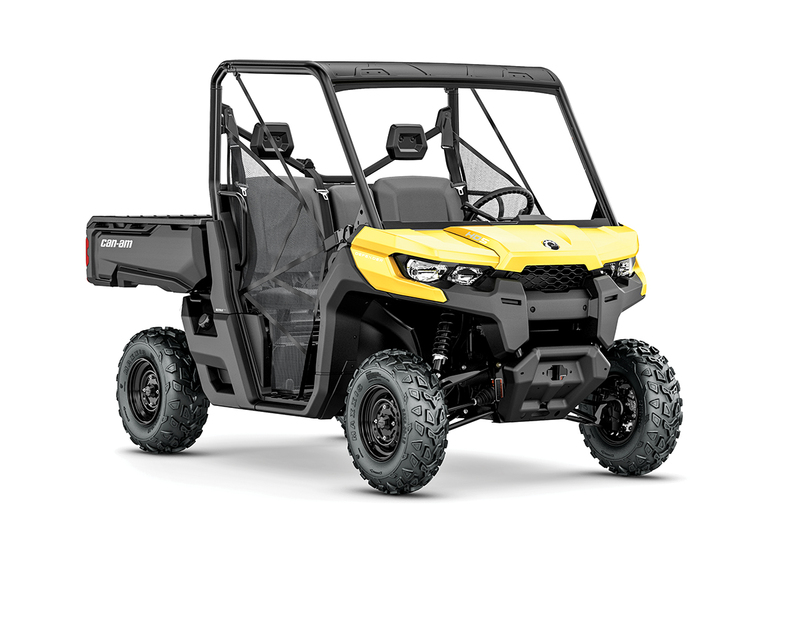 Cub Cadet unleashes the new Challenger MX 750 and 550. Overall, it’s a great year to go recreating and exploring in a UTV! The Commander series features a dual-level bed with locking lower level and trailing-arm rear suspension with 10 inches of travel. DPS models have EPS with three levels of selectable assist. 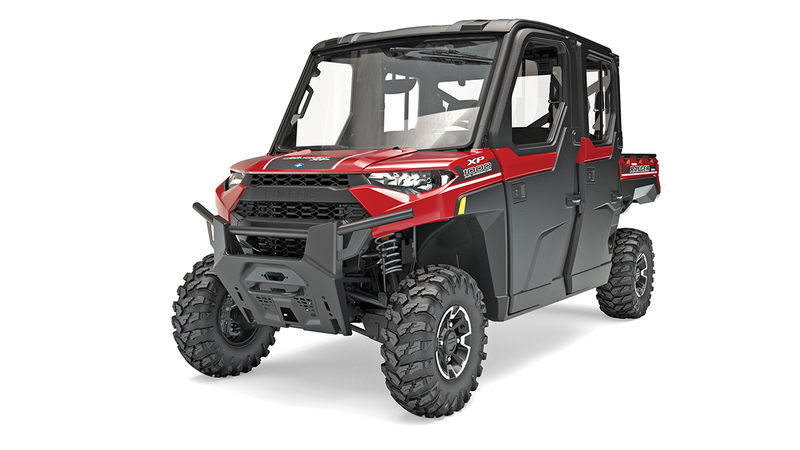 XT models upgrade to a 4500-pound winch protected by an H-D front brush-guard bumper and mudguard over-fenders, along with three color choices. Claimed dry weight 1,291.4 lb. The Limited sports new Triple Black paint for 2019 and has a $200 price reduction. 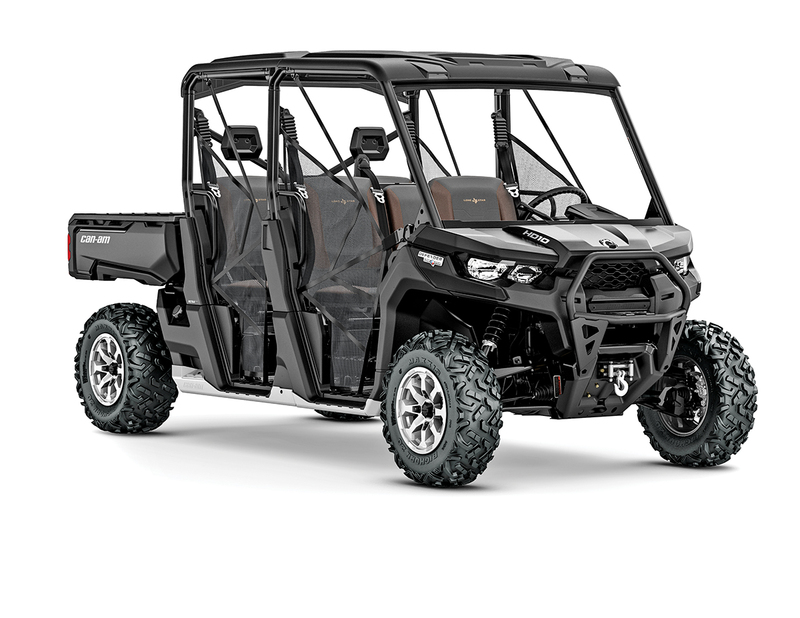 The LTD boasts a roof, half windshield, H-D front brush guard, 4500-pound Warn winch, Fox 2.0 Podium QS3 easy-adjust shocks, a Bluetooth-ready sound system with pod speakers, and a Garmin Montana 650t touchscreen GPS for navigation and ride sharing. Claimed dry weight 1321 lb. The 976cc V-twin makes up to 72 horsepower and three drive modes—Eco, Normal and Work—along with turn-aiding 1WD to locked 4WD with a Visco-Lok QE front diff. 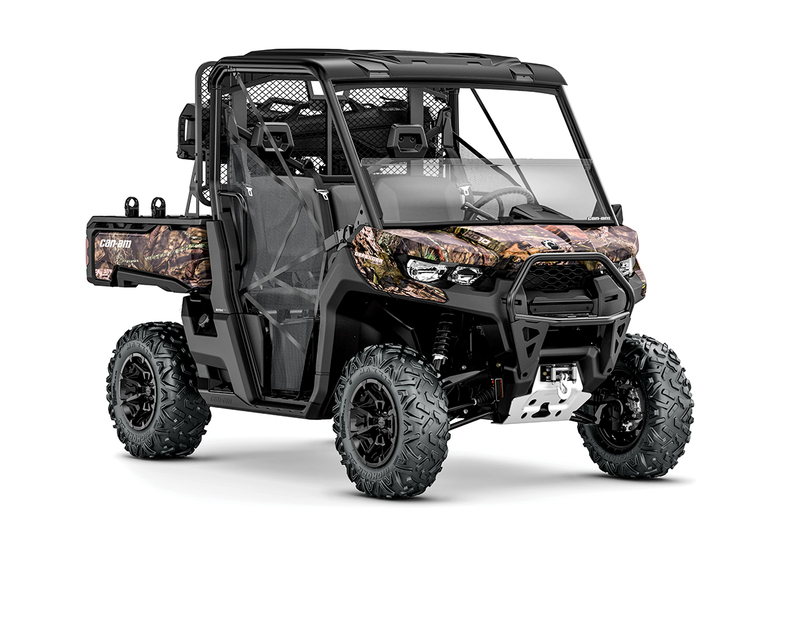 Dynamic Power Steering HD10s have three EPS-assist levels, while the XT package upgrades to a 4500-pound winch, front bumper, skid plate and two paint choices or Mossy Oak wrap. It seats three. Transmission Dual-range CVT w/EBS & rev. Bed capacity 1000 lbs, CA 600 lb. Claimed dry weight 1,414 lb. In addition to 10.4 gallons of in-dash storage, XT Cab Defenders sport a tilt-out windshield, doors with sliding windows and rear sliding window. Defender HD10s produce 72 horsepower with several drive modes. The XT-P package adds Carbon Black paint with red suspension arms, front bumper, rock sliders and graphics plus Fox 2.0 Podium piggyback shocks to the XT package. Claimed dry weight 1,844 lb., XT-P 1,556.5 lb. A full HMW skid plate, aluminum rock sliders, and pre-runner aluminum front skid plate protects the underside and 4,500-pound winch. Mossy Oak’s Break-Up Country Camo and two Kolpin Stronghold Gun Boots aid the hunt, along with LinkQ bed-rail impact and tool holders, a full headache rack, side mirror, Ram LED spotlight and half windshield. Claimed dry weight 1,660 lb. The HD10 X mr has a snorkeled CVT and relocated engine air intake, as well as a Mud Smart-Lok front-diff mode. Suspension arms are arched for ground clearance and tires are 30-inch ITP Cryptids on 14-inch rims. The 4500-pound winch is above water level. All Defenders have Intelligent Throttle Control (iTC) with Eco, Work and Normal driving modes. Claimed dry weight 1,679 lb. The 79-horsepower, 963cc V-twin makes 60 pound-feet of torque and a dual-range CVT with EBS. The 1000 seats three, tows a ton and carries 1,000 pounds of cargo, and it has large-volume storage bins for working and playing. 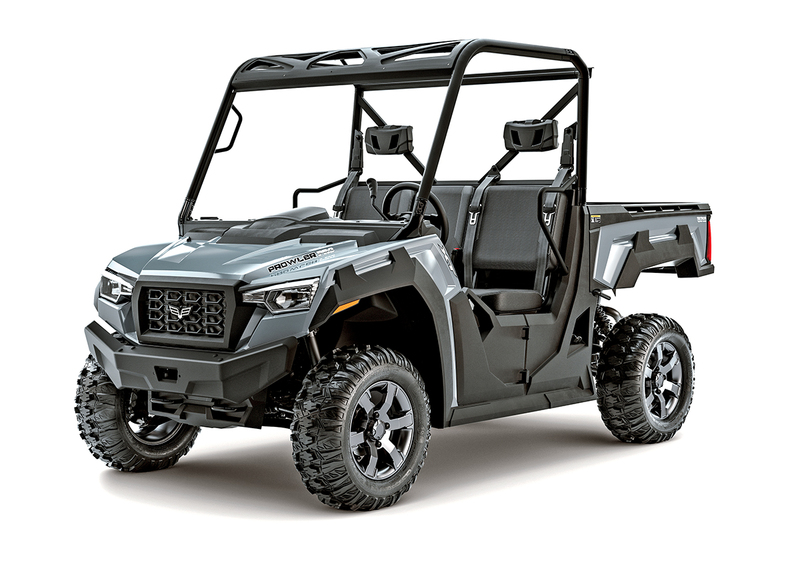 It has gull-wing lower A-arms for ground clearance (11 inches), a hard roof, full skid plates, a 3500-pound winch with H-D front-bumper protection. Claimed dry weight 1,520 lb. 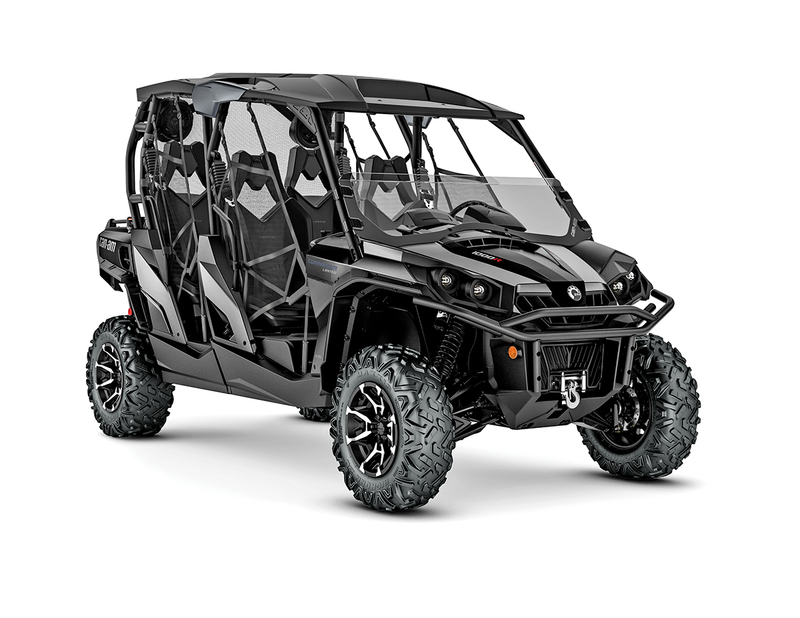 Hisun outfits its UTVs for the long haul with EPS, a 4500-pound winch, roof, two-piece windshield, turn signals, horn and doors gracing the Sector 1000. 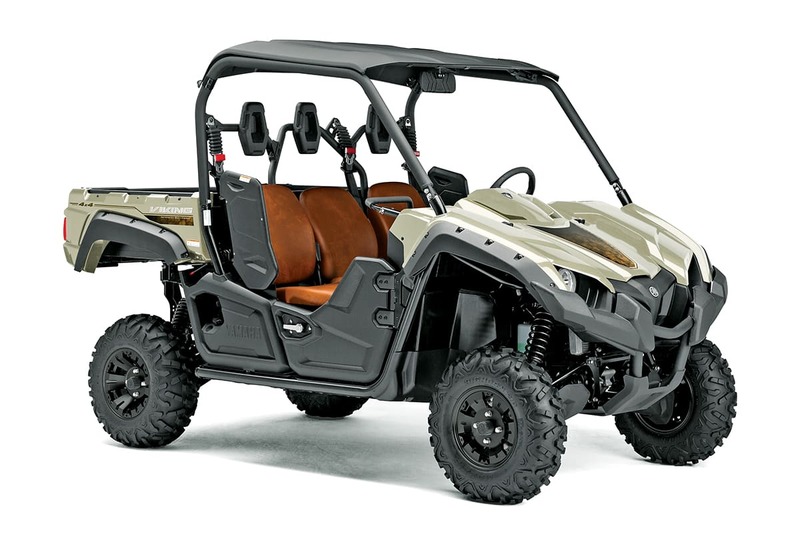 It also has an analog speedometer and tachometer with LCD screen for rider information and a power-tilt cargo bed with 1000-pound capacity. With 10 inches of travel, it plays as well as works. Claimed dry weight 1,764 lb. Much of the technology that went into the all-new Talon was developed on the Pioneer 1000 and LTD, including the Dual-Clutch Transmission six-speed lower-end, Intelligent-4WD system that uses individual disc brakes to control and maximize traction while minimizing steering effort, and hill-start assist. The LTD also has quick-adjust Fox Podium QS3 shocks. Transmission Automatic dual-clutch 6-speed w/rev. Bed capacity 1,000 lbs, CA 600 lb. Claimed curb weight 1,564 lb., LTD 1,642 lb. 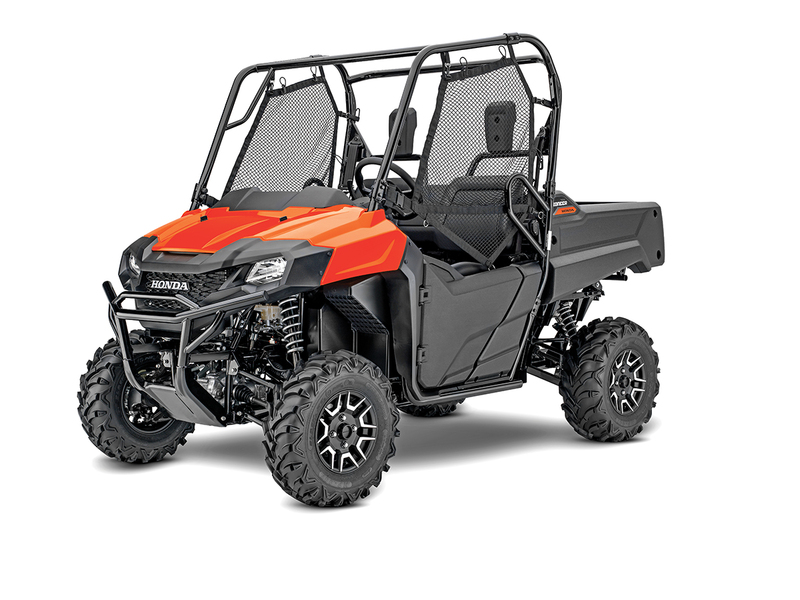 With an 82-horsepower ProStar EFI twin, dual-range CVT with EBS and 11 inches of independent wheel travel, the Ranger 1000 EPS likes to play as hard as it works (2500-pound towing and 1000-pound bed). New: The Premium Ranger gets three new choices in paint—Steel Blue, Pearl White and Magnetic Grey—and the 20th Anniversary Premium LE is Maroon Metallic. Claimed dry weight 1,565 lb. The 82-horsepower twin is assisted by mud-specific gearing in the CVT and high-mount snorkel air intakes and vent lines. Arched A-arms and stiffer shock springs maintain the 13.5-inch ground clearance, while High Lifter 28-inch Outlaw 2 tires dig for traction. The Polaris Pro 4,500-pound winch is mounted high on the H-D front bumper unsticking lesser vehicles. Claimed dry weight 1,561 lb. Extreme weather is no match for the Northstar Edition’s air-conditioning and heating system, which is complemented with the Premium Ranger Pro-Shield cabin system including Lock & Ride Sport Roof, Windshield with wiper and washer and Glass Rear Panel plus Premium Roof Liner, Dome Light and Manual-Crank Window Doors. Seals and gaskets are larger, too. Claimed dry weight 1,875 lb. The Havoc X introduced Textron’s 100-horsepower twin with On-Demand AWD, Fox Podium 2.5 QS3 shocks with over a foot of travel, and 28-inch ITP Ultracross tires in 2018. New for 2019, the Havoc and Backcountry Edition join the X. 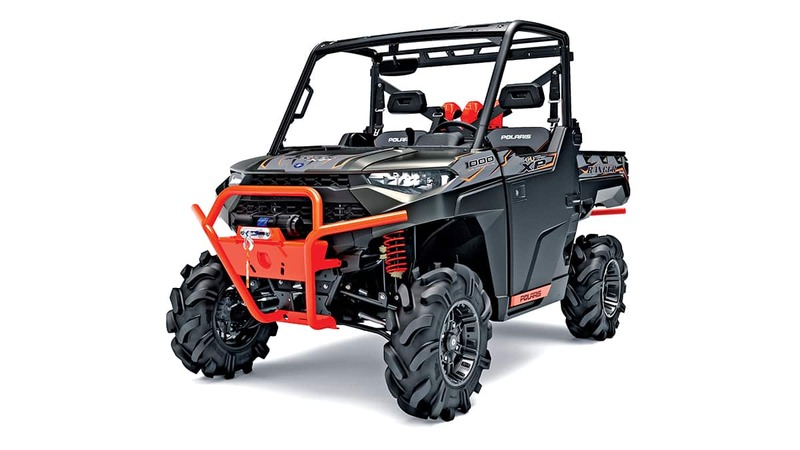 The Havoc has performance shocks and 27-inch tires, while the Backcountry shares the X’s 4500-pound Warn winch, suspension and tires, and adds a roof and front rack. Claimed curb weight 1,755 lb. 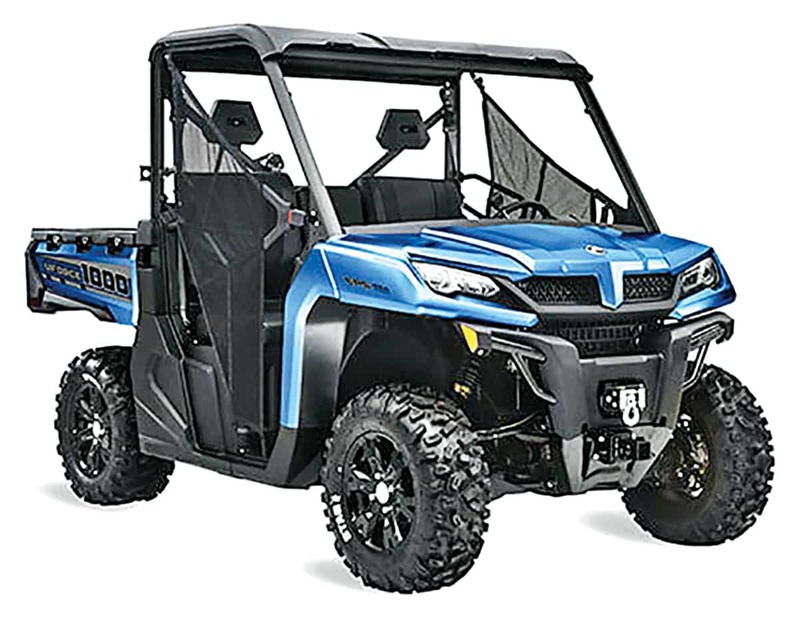 Textron’s original Stampede is now $300 less in Earth Blue/Jet Black with an 80-horsepower inline twin, making 59 pound-feet of torque, EPS, On-Demand AWD, dual torsion bars, a standard hood rack and extra-cab design with 24 cubic-feet of storage. The 900 X adds 27-inch Bighorns on aluminum wheels. 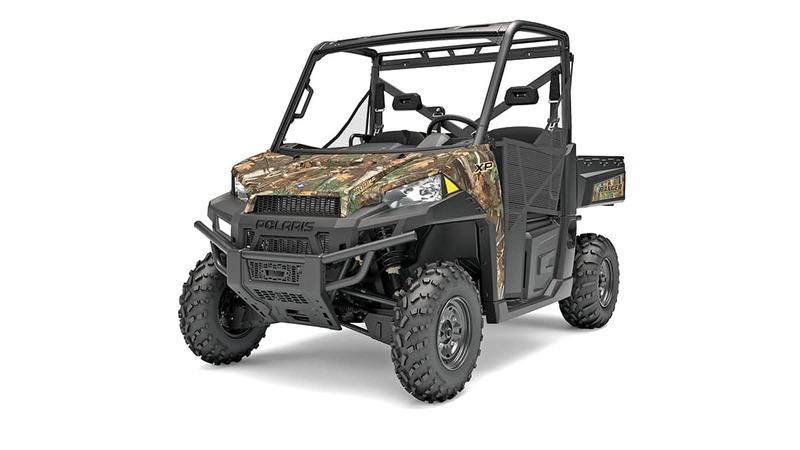 New: The Hunter adds a 4500-pound Warn winch, roof and new True Timber Camo. 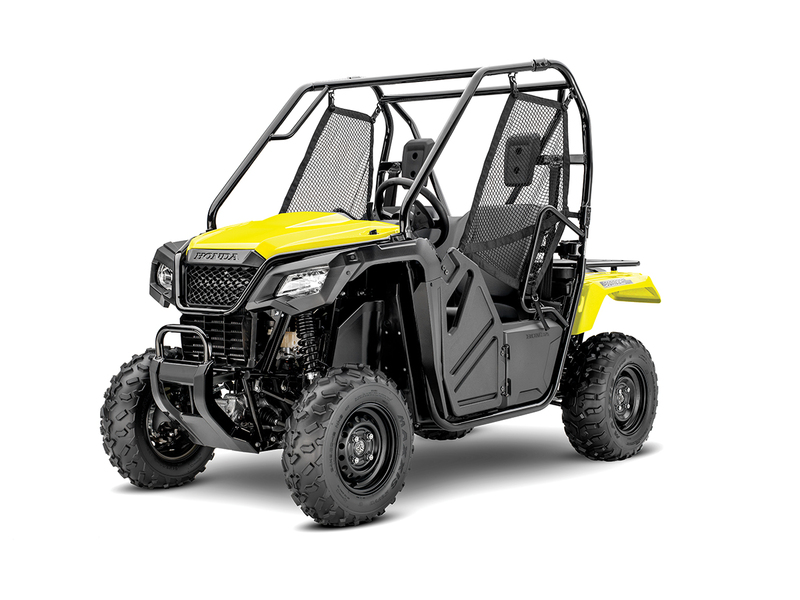 With 14 less horsepower than the Ranger 1000, the XP 900 is a steal at a $2500–$3000 lower price. Tow a ton and carry a half-ton in the XP 900 bed, and storage is 37 liters. It has the same On-Demand 4WD with 1WD Versa-Trak mode but no EBS. EPS versions also come in Solar Red, Orange Madness or Military Tan paint that you can’t get with the XP1K. Claimed dry weight 1,324 lbs, EPS 1,342 lb. 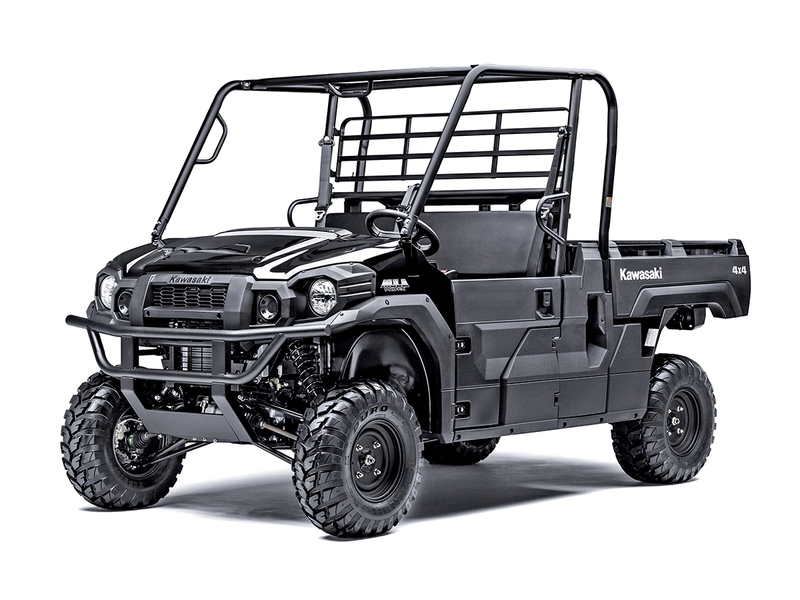 This 800cc V-twin pumps out 60 horsepower, making it more sporty than the original Rhino, yet it’s ready for work with 1500-pound towing and an electric-lift tilt bed with 500-pound capacity. It also sports tow-tone aluminum rims and side mirrors, but the roof and windshield are options with additional cost. Claimed dry weight 1,342 lb. 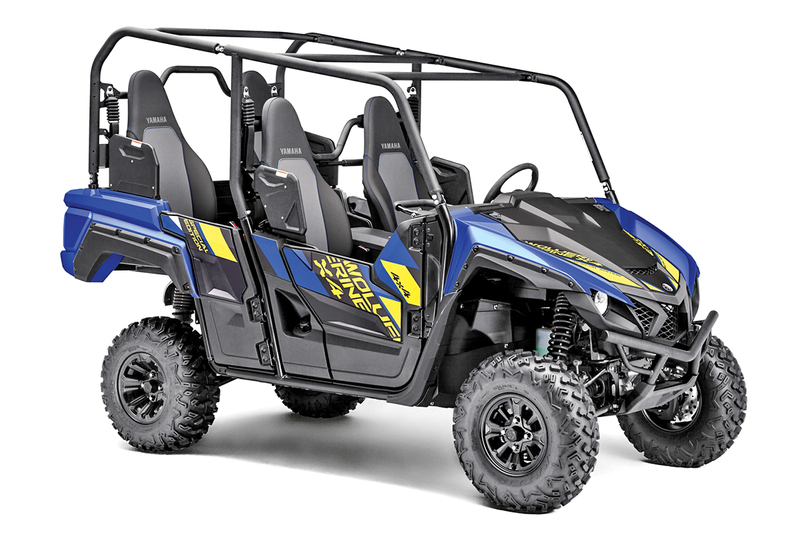 New: Wolverine X2s sport Yamaha’s first twin-cylinder UTV engine with off-set cylinders, short stroke with short rods, dry-sump for low CG, special-cut quiet gears and mid-engine design. 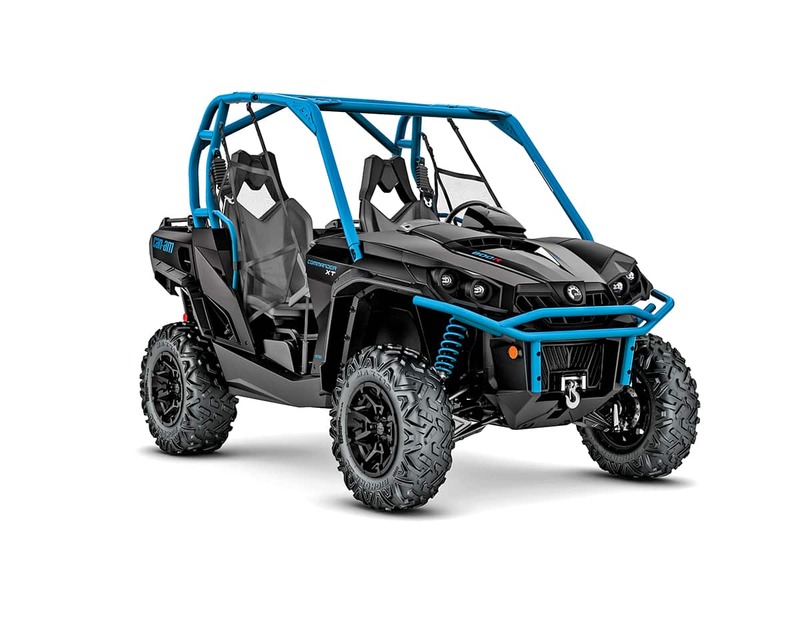 R-Specs upgrade to adjustable piggyback KYB shocks, aluminum rims and a roof, while the R-Spec SE adds Tactical Black or Backcountry Blue paint. All have a 10-year belt warranty! Claimed curb weight 1,541 lb., R-Spec/SE 1,586 lb. 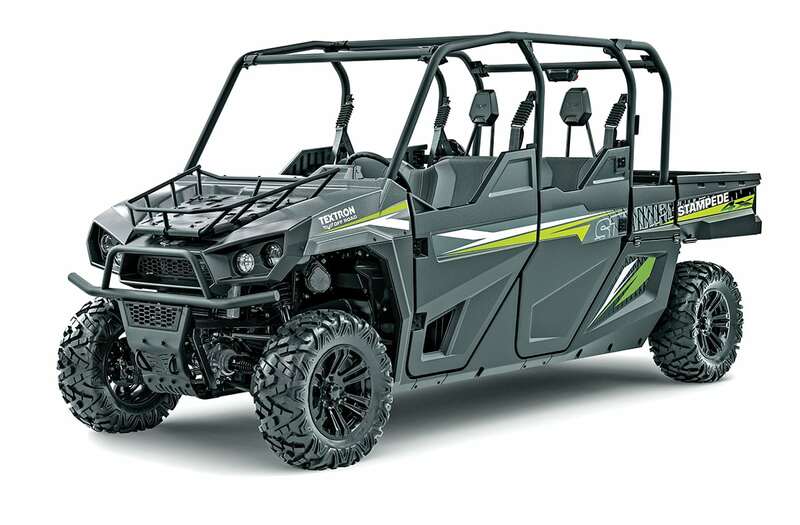 The Gator XUV835 propels three people up to 45+ mph with its 54-horsepowe triple, and triple sips 11.2 gallons of gasoline for long-range fun. It’s competitive with 1-ton towing, half-ton toting and 16 gallons for storage. Packages include E (non-EPS), M (add EPS) for $1000 less than last year, and M Cab with a fully-enclosed cabin and windshield wiper. Claimed dry weight 1,793 lb. While the Pro-FXR has slightly less travel than the Gator. It sports EBS and a Turf-mode rear diff, plus a fully locking front diff for tough terrain. 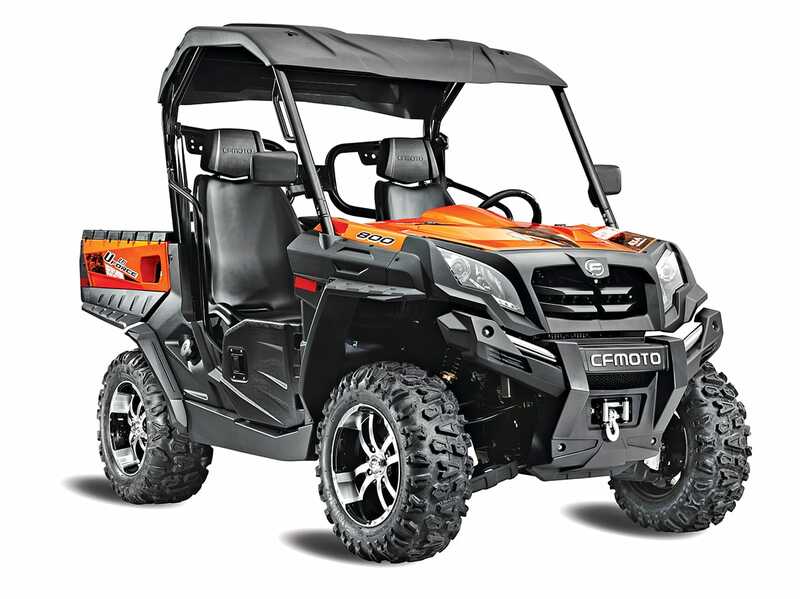 It also sports a sun top, auxiliary LED headlights and H-D front and rear bumpers, and the 27-inch tires ride on two-tone aluminum wheels. Candy Plasma Blue is a new Stone Cold paint choice for 2019. Claimed curb weight 1,768.4 lb. Sporting the same torquey, quiet triple as the FXR, the Pro-FX seats three and has a massive 20 square-foot dump bed for $2,900 less. 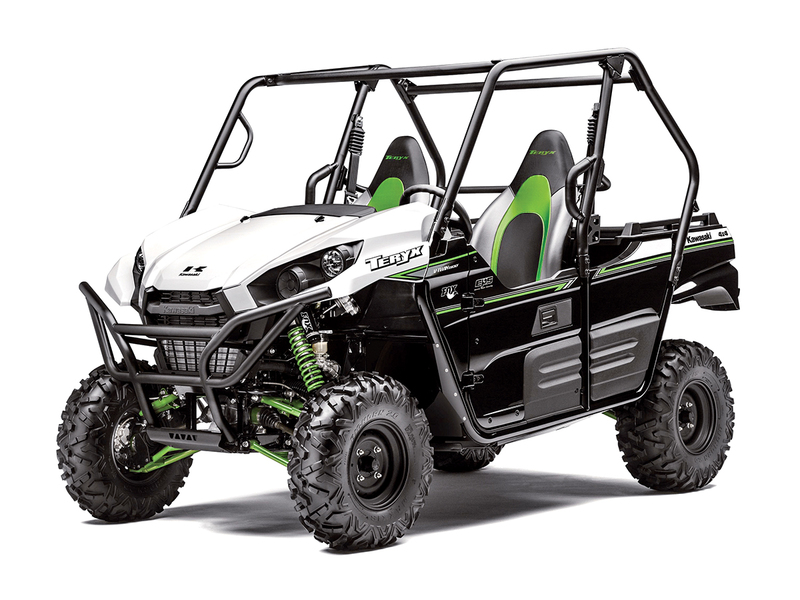 Add $1,000 for Kawasaki’s speed-sensitive EPS for easier turning from the 92.3-inch-wheelbase Mule with rack-and-pinion steering. Unlike the XUV835, the Pro-FX has engine-braking drive modes from 1WD to diff-lock 4WD. Claimed curb weight 1,817 lb. ; EPS 1,830.2 lb. The 812cc DOHC triple produces 48 pound-feet of torque at 3500 rpm and does 40+ mph in high with a 34mm EFI throttle body. Both diffs unlock or lock as needed, and EBS aids steep descents. The Limited Edition package adds Firecracker Red automotive paint, machined-black cast-aluminum wheels, a hard roof and auxiliary LEDs to the halogen headlights. Claimed curb weight 1,832.4 lb. Claimed dry weight 1,567 lb. The Bright White 800R has a $800 price drop for 2019, DPS 800s have a $850 lower MSRP and XTs are $750–$850 cheaper. The base 800R has steel wheels and no EPS, while DPS models upgrade to Tri-Mode EPS and trick aluminum wheels. The XT package adds a 4500-pound winch, H-D front bumper and brush guard, and two paint choices. 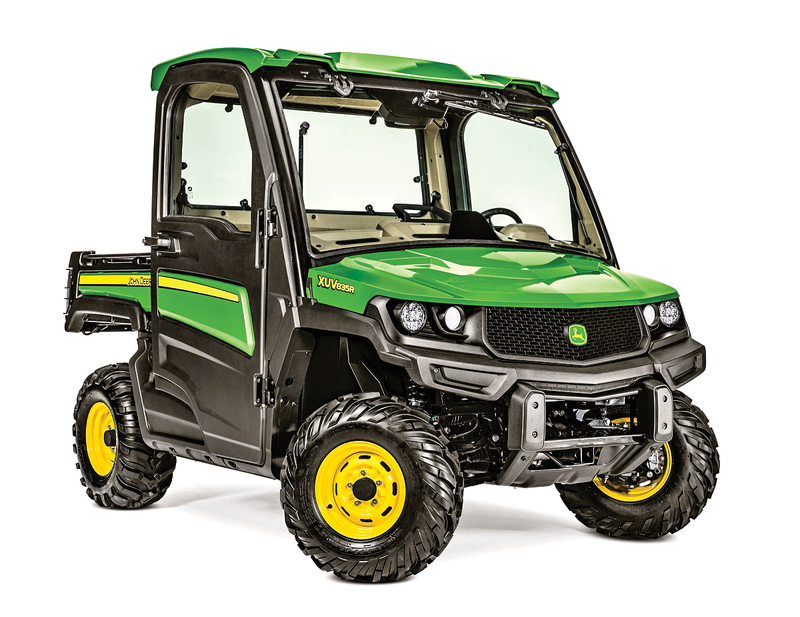 Defenders go from turf-saving 1WD to diff-lock 4WD, with HD8s being powered by a rear-mounted V-twin making 50 horsepower and 50 pound-feet of torque. Width is 62 inches with a rear torsion bar, and wheelbase is 83 inches for fun after the work is done. Dashes sport a lift-out tool box, and DPS models have EPS with three assist choices. XT Defenders sport a roof, 4500-pound winch and front bumper, along with Hyper Silver or Intense Red paint or MOBUC Camo wrap. Extreme cold isn’t as frigid with the XT Cab package, including a hard roof with a tilting full windshield, full doors with sliding side glass and a sliding rear window. It also includes a 4500-pound winch and Hyper Silver paint. Claimed dry weight 1,557.7 lb. ; XT, Cab 1,425 lb. The 62.5-horsepower, 799cc V-twin makes 53 pound-feet of torque with a CVTech performance CVT clutch and locking front diff, while the 495cc single makes 38 horsepower and 32 pound-feet of torque. Both have a high-performance CVTech drive and drive clutch system. Both have doors, self-draining seats, roofs, side mirrors, LED projector headlights and 3000-pound winches. Claimed dry weight 1,377 lb. ; 500, 1,288 lb. 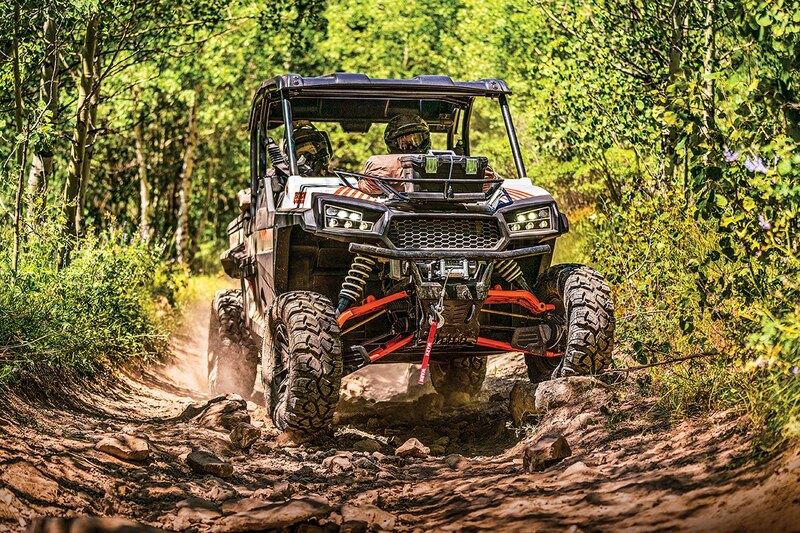 The Teryx is actually a 783cc V-twin with 47 pound-feet of torque at 5500 rpm, so its more sporty than Pro Mules. This beauty has Fox Podium 2.0 shocks with adjustable compression damping and Maxxis Bighorns on trick machined rims. Limited Editions sport Matrix Grey Camo or new Candy Steel Furnace Orange paint and a hard roof. The aftermarket makes long-travel kits for a limo ride. 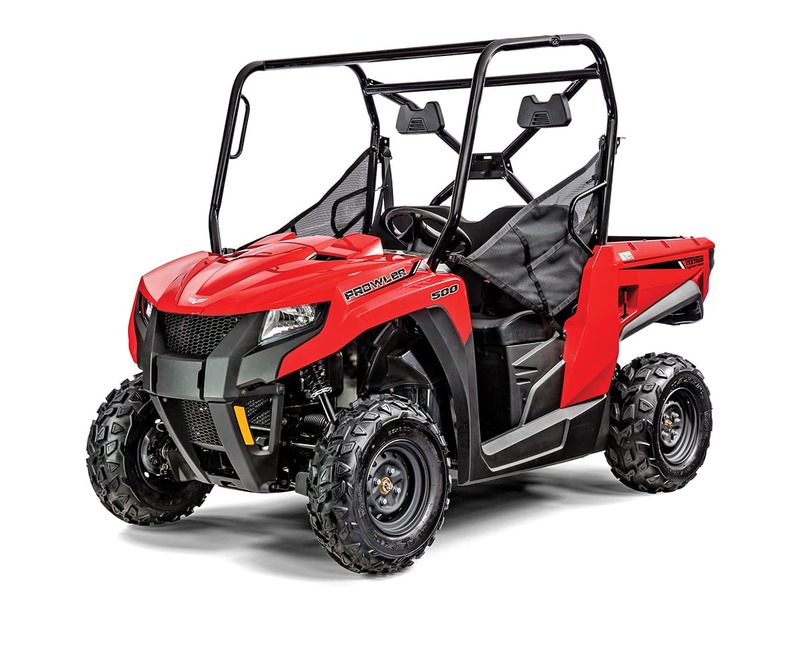 The Challenger 750 MX speeds up to 45 mph with a 735cc EFI, 5-valve, 37.5-horsepower single, while the MX 550 makes 27.5 horsepower via a 546cc EFI single. 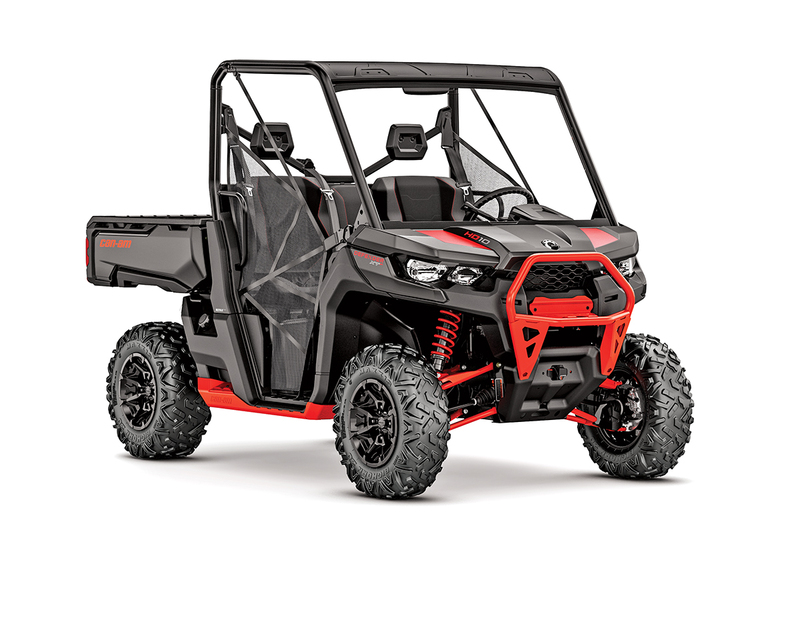 Both sport LED headlights, a digital dash, a 3500-pound winch, H-D front bumper, side mirrors, full windshield, high half doors and aggressive 26-inch tires. Claimed dry weight 1,580 lb. Power domes from a 735cc single with a 102mm piston, 90mm stroke with a Delphi EFI system. 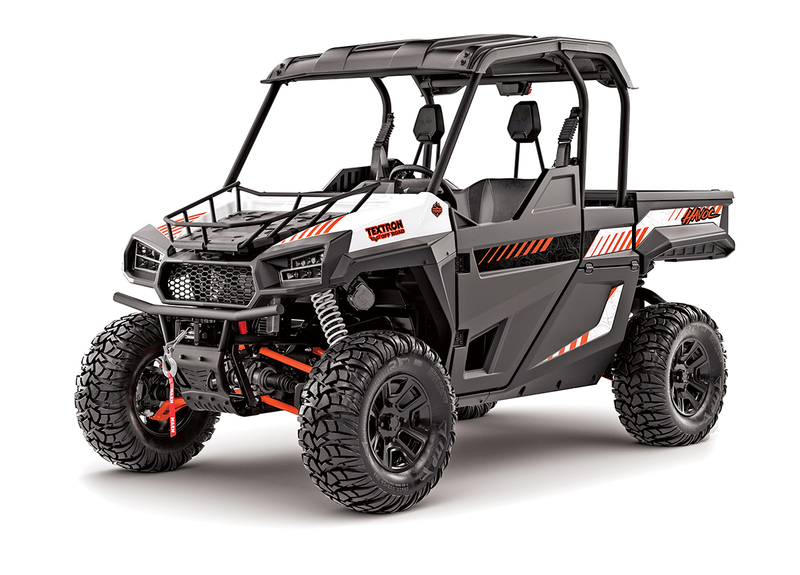 The Sector 750 is one of the best-equipped UTVs with EPS, a standard 3,500-pound winch with heavy-duty front bumper, roof, split windshield, turn signals, horn, side mirrors, doors, bed rails, aluminum wheels and a two-year limited warranty. Claimed dry weight 1,638 lb. 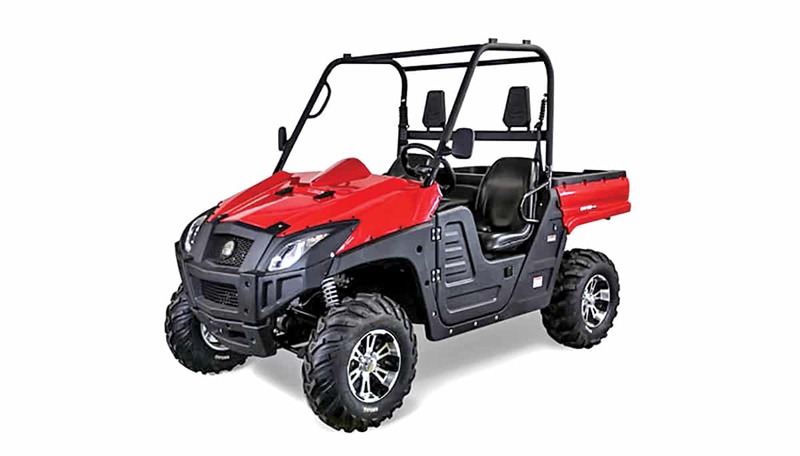 Honda’s Pioneer 700 is the only UTV with an automotive-style torque converter and automatic three-speed transmission instead of a CVT, and you can let it do the shifting or get sporty with paddle shifters with the Deluxe 700. Deluxe models also upgrade to two-tone aluminum wheels and Pearl Orange paint or a Honda Phantom Camo wrap. Claimed curb weight 1,268 lb. 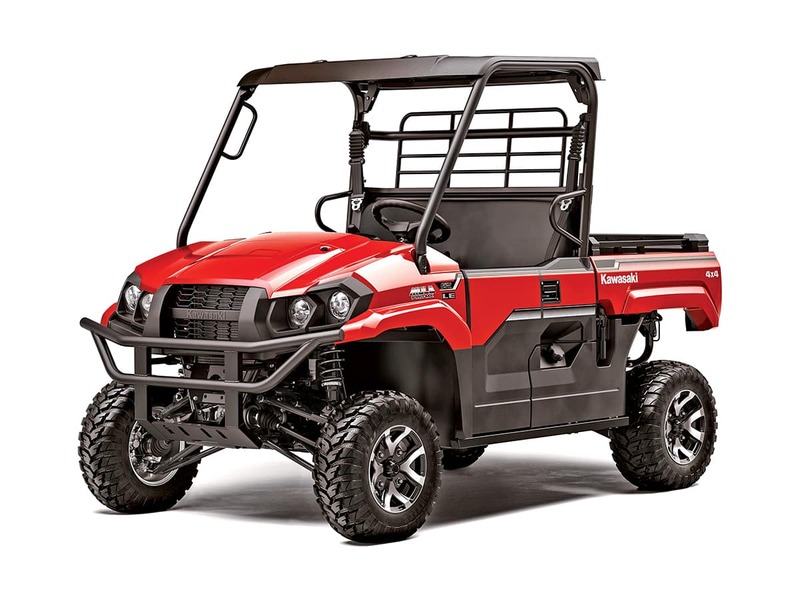 New: The Mule Pro-MX is a midsize, two-seater with 60-inch width and a 695cc EFI single with massive 42.7 pound-feet of torque. All Pro-MX models sport EPS, a tilt wheel and combination Halogen/LED headlights. The LE adds a roof, alumni wheels and red paint. Camo MXs add True Timber HTC Green Camo to LE gear. Claimed curb weight 1,587.6–1,598.6 lb. 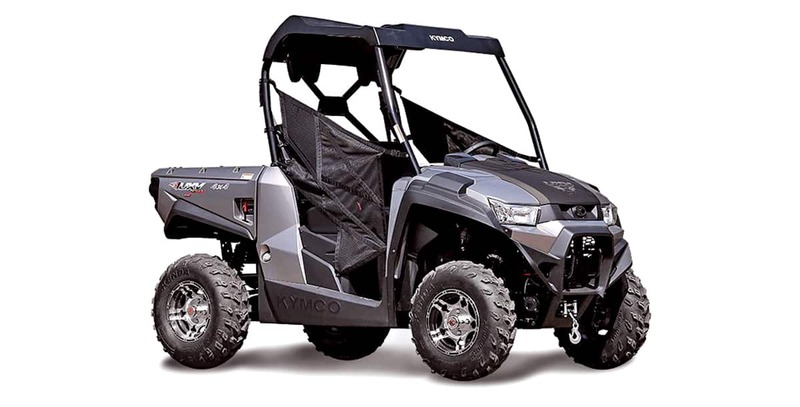 Kymco USA offers its stylish UXV700I in five variations—Base, Camo, Limited, Prime and Hunter—with all but the base model sporting EPS. All sport new Ultra high-back seats, Kaifa fully adjustable gas shocks, new sport cage with more headroom, an upgraded CVT and under-hood storage. 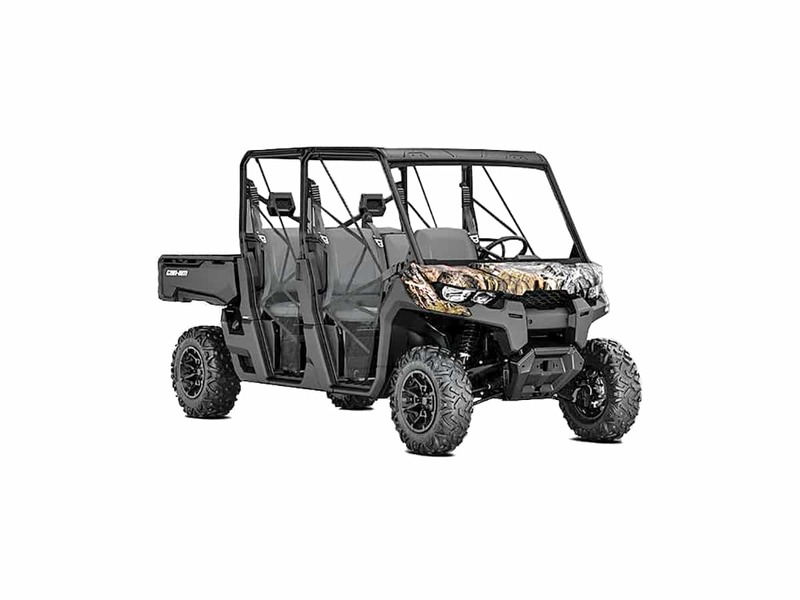 The Prime has a roof, winch and windshield, and the Hunter adds a gun case and bed extender. Claimed dry weight 1,137 lb. ; LE, 1,218 lb. 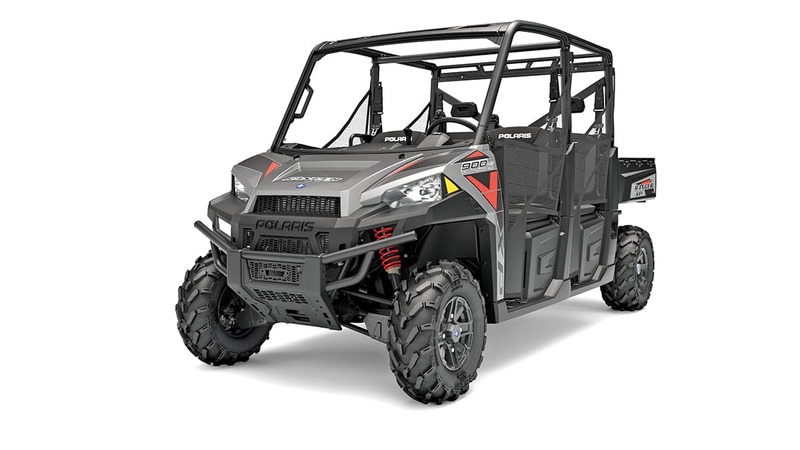 Vikings sport the Rhino engine in a three-person chassis with an air intake that needs service yearly. The CVT belt has a 10-year warranty, and it’s one of the few base-model UTVs that comes with a roof. 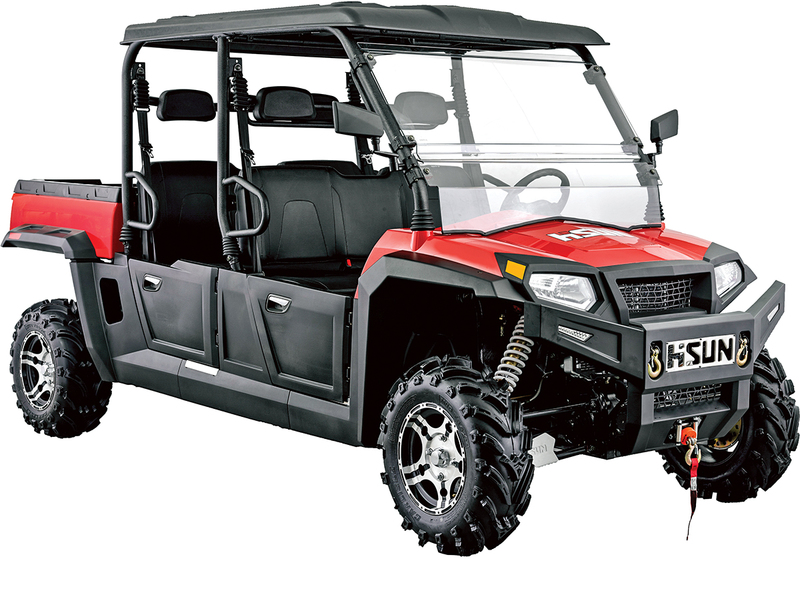 EPS Vikings enhance handling on all terrain types with less steering effort for $1000. The Realtree Edge Camo version with aluminum wheels is an extra $900. Claimed curb weight 1,420 lb. ; EPS, 1,431 lb. Vikings sport a steel cargo bed that totes 600 pounds. Special Editions sport trick aluminum wheels, Backcountry Blue paint, under-seat storage and over-fenders for only $100 more than the Camo EPS. Ranch Edition Vikings sport Metallic Sand paint in addition to all special-edition features, plus a rear-view mirror. All Vikings have a roomy, comfortable cabin. Claimed curb weight 1,448 lb. 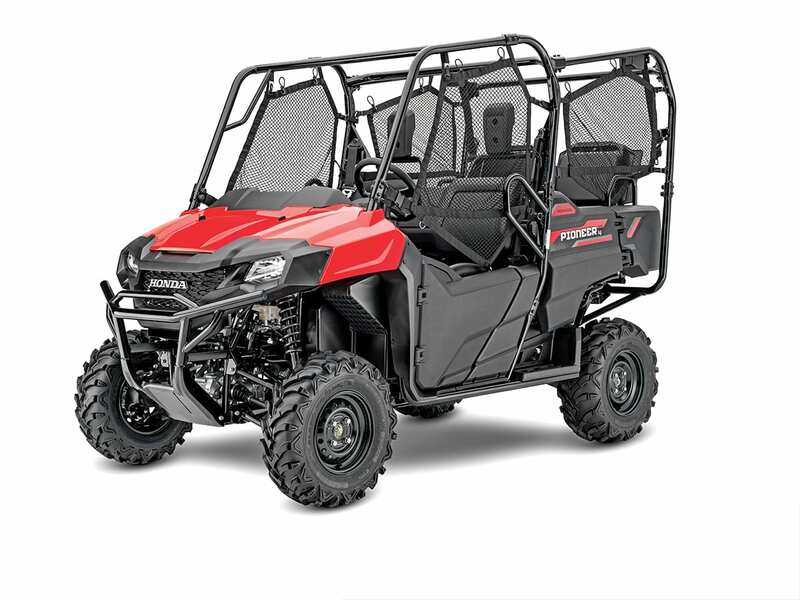 The 567cc ProStar single makes 44 horsepower, enough to carry three people and 800 pounds in the cargo bed. The rear diff unlocks in Versa-Trak Turf mode, and it locks up for On-Demand AWD for gnarly terrain. Four-wheel hydraulic discs have dual-piston front calipers, so it stops securely even when towing up to 1500 pounds via a 2-inch receiver. Claimed dry weight 1,070 lb. 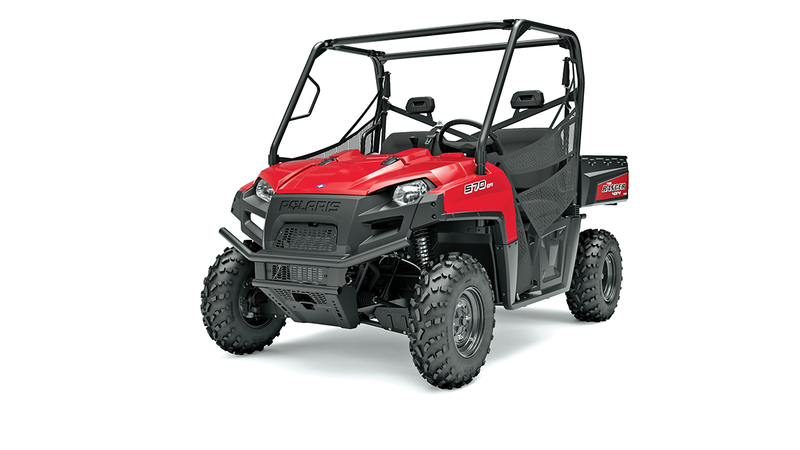 Polaris also makes a two-seat 570 with the same 44-horsepower single but slightly less cargo capacity (500 pounds). It has drive modes from 1WD to 4WD with a sporty 73-inch wheelbase for spirited cornering. The 570 EPS upgrades to variable-assist EPS, machined black-aluminum Accelerator wheels, and Nara Bronze automotive paint. Claimed dry weight 1,073 lb. 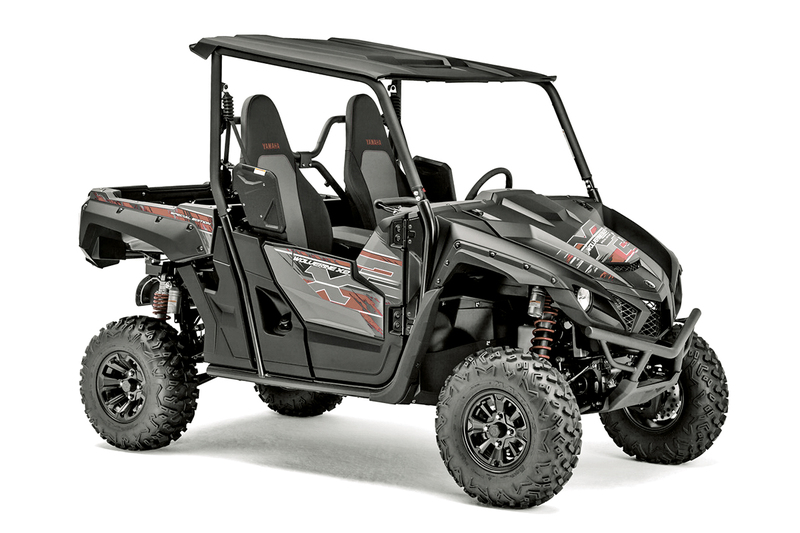 Textron’s 443cc liquid-cooled single has a 89mm piston and 71.2mm stroke with EFI and a Duramatic CVT transmission. Surlyn body panels have aggressive styling with a sloping pick-up-like hood, halogen headlights, under-hood storage, tilt wheel, stylish dash-center instruments,12-volt DC outlet and controls, and tilt bed with 500-pound capacity. Claimed dry weight 1,095 lb. 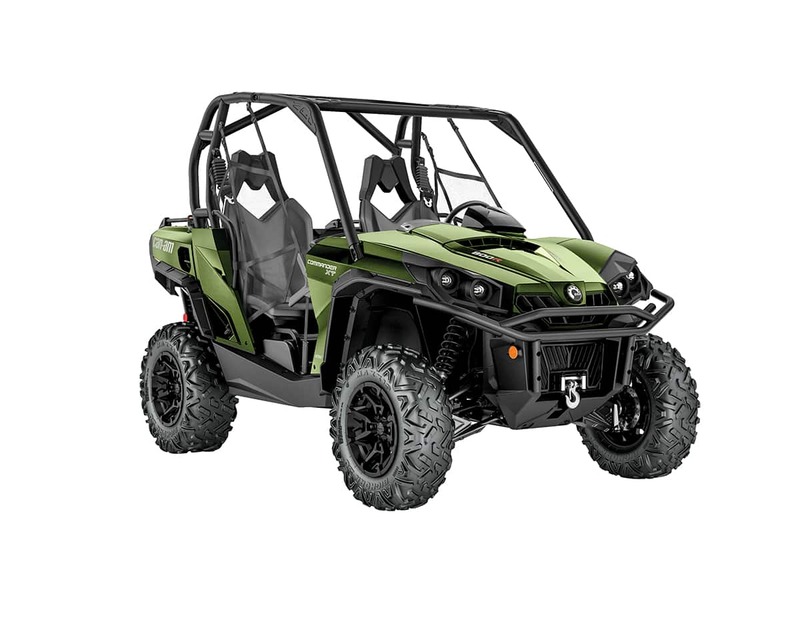 The HD5 sports a 427cc single that puts out 38 horsepower and is mated to a CVT that has standard engine braking and electronic belt protection and hill-descent control. The rear end doesn’t unlock, but the front diff has Visco-Lok QE. The HD5 has steel wheels, while the HD5 DPS upgrades to trick aluminum rims and EPS with three-level assist selection. Claimed dry weight 1,305 lb. 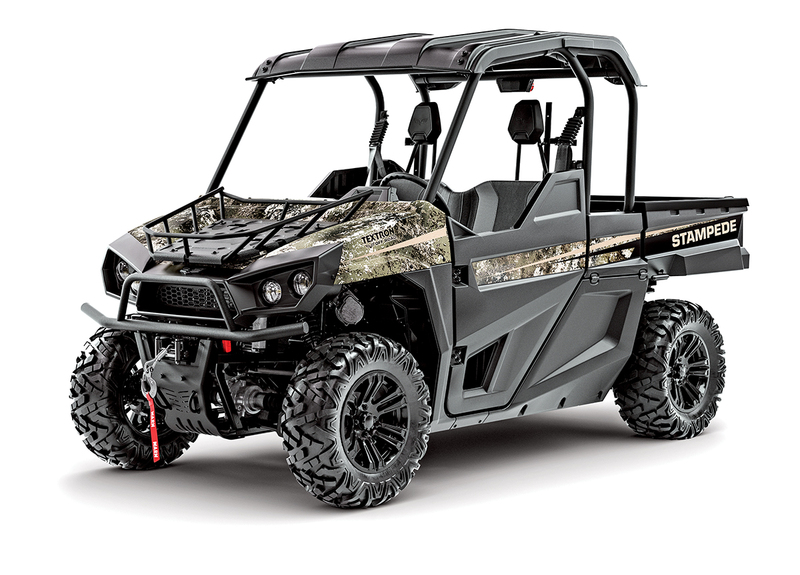 The 501cc single makes 36 horsepower and 28.9 pound-feet of torque with a 92mm piston and 75mm stroke, and hydraulic-assist shocks help raise the tilt bed with 440-pound capacity. Kymcos have a locking glove box, plus under-hood and under-seat storage. 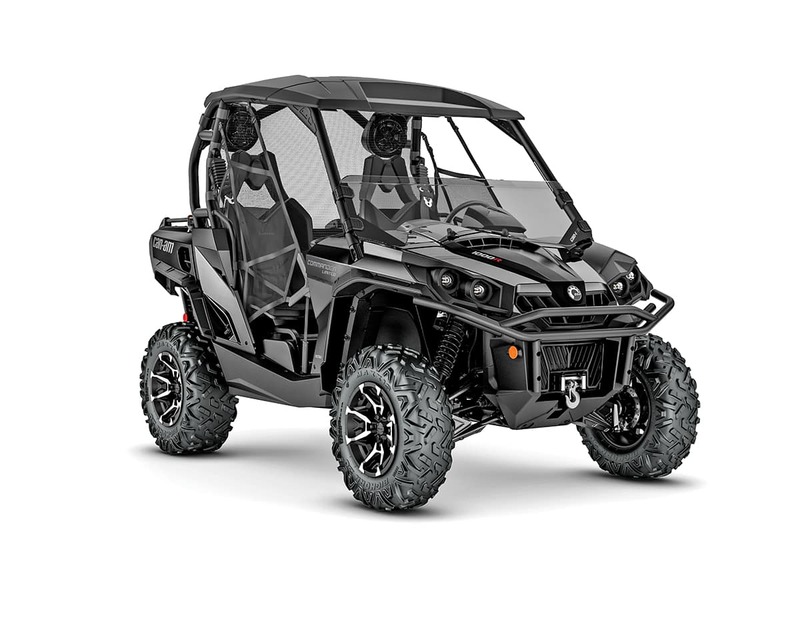 XUVs are among the only 500cc utility machines to sport a fully locking front diff and hold CARB/EPA approval. Transmission Dual-range CVT w/ rev. Claimed dry weight 1,157 lb. The Pioneer 500 only makes 29 horsepower, but the engine is sideways in the frame for efficiency, and it has a five-speed electronic-shift transmission with auto-shift and reverse. Choose from full-auto or manual-shift via paddle shifters. 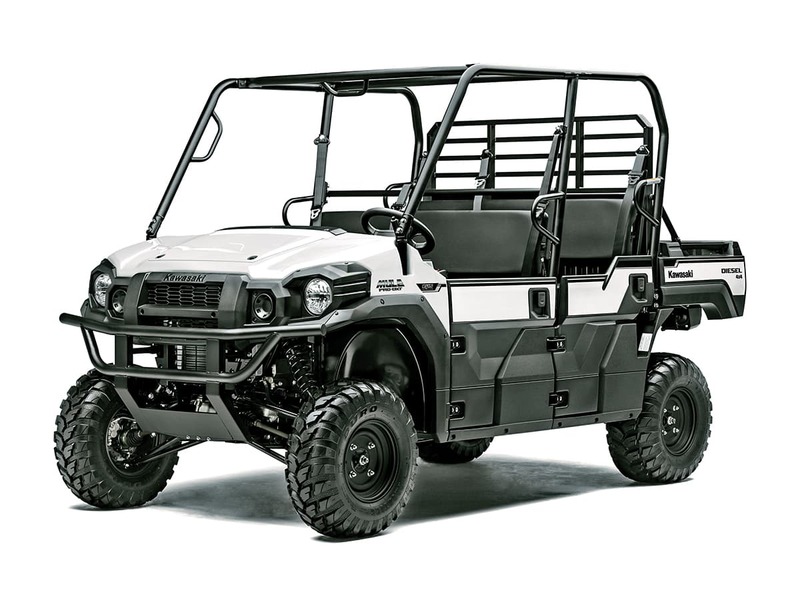 This is Honda’s only 50-inch UTV, which means it fits in the back of a pickup and on USFS trails. Active Yellow and white are new colors. Claimed curb weight 1,025 lb. 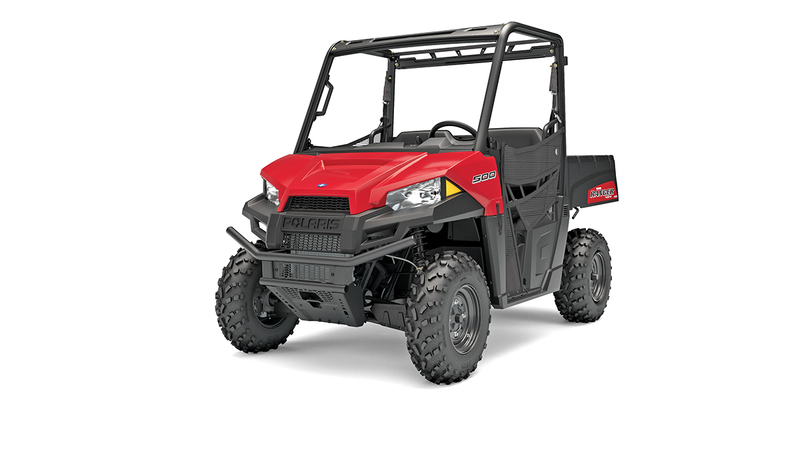 A 500cc ProStar single provides 32 horsepower, and three drive modes tune delivery from a turf-saving 1WD to sure-footed 4WD. Two people ride comfortably with MacPherson-strut front and dual-A-arm rear suspension with 9 inches front and 10 inches of rear travel. 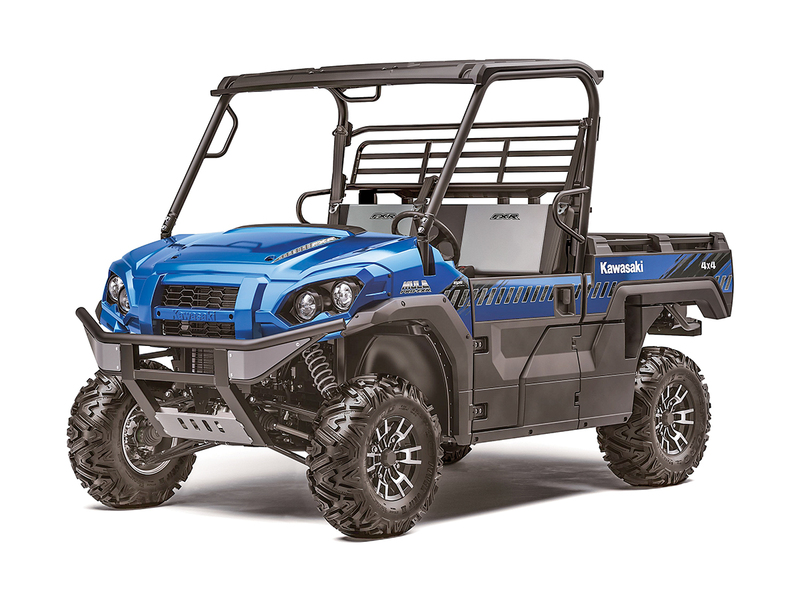 Ranger 500s will tow 1500 pounds via a 2-inch receiver and carry 500 pounds in the dump bed. Claimed dry weight 1,065 lb. Kymco offers the 450i in six trim modes, all powered by a 33-horsepower 443cc EFI single. All have sleek styling and tailgate storage. The Turf has turf tires and unlocking rest diff. LEs upgrade to a roof and machined aluminum wheels, while Primes add a windshield, rear tubular bumper and mirror. Hunters have the Prime package with an extended bed and gun boot. Claimed dry weight 1,080 lb. LE/Hunter 1,095 lb. 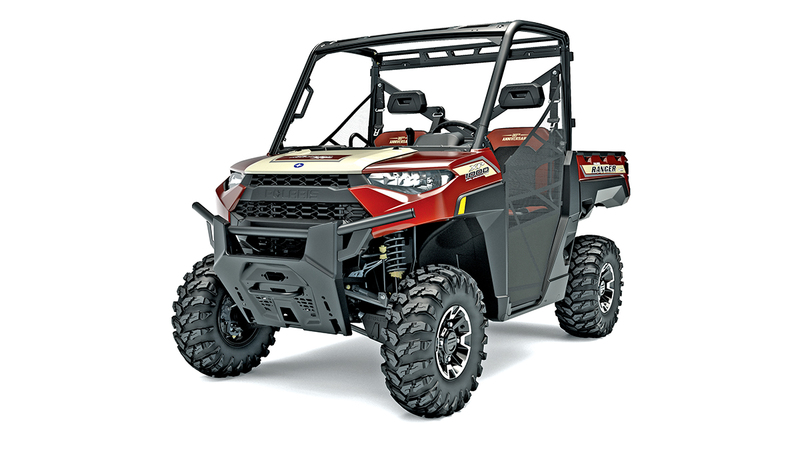 The four-seat Commander 1000R Max sports an 85-horsepower, 976cc V-twin; a CVT with EBS; and a Visco-Lok QE quick-engaging front diff. The XT package includes a 4500-pound winch protected by a heavy-duty front bumper and mudguards. The Max LTD upgrades from HPG to Fox 2.0 Podium QS3 shocks, Bluetooth sound system and Garmin Montana 650t GPS. Claimed dry weight 1,572.4 lb. The HD10’s 976cc V-twin is tuned for 72 horsepower and has three drive modes to further fine-tune delivery. DPS Maxes have three-mode EPS, while the XTs upgrade a 4500-pound winch, H-D front bumper and full skid plate. XT Cab Maxes add a tilting front windshield to the hard roof, four half doors with windows (with front sliders) and a sliding rear window. 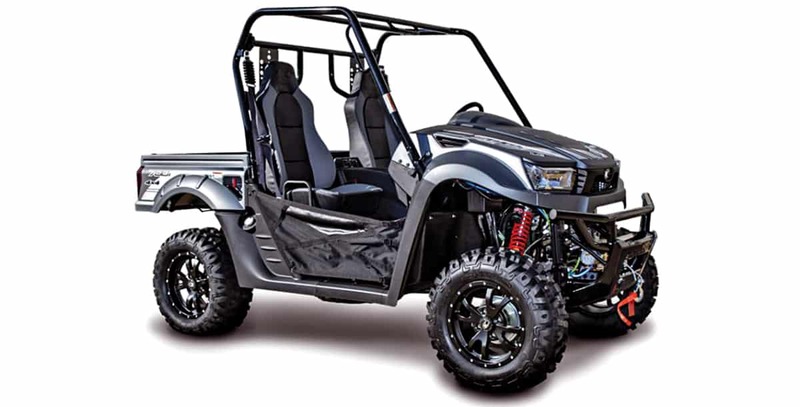 Salute Texas with dual two-tone seats with Lone Star badges and trim, arched high-clearance A-arms, 28-inch Maxxis Bighorn 2.0 tires on 14-inch two-tone rims, a 4,500-pound winch and H-D front bumper. The 72-horsepower V-twin has three throttle maps and a QRS CVT with EBS, Hill-Descent Control, and belt protection. Both diffs lock and unlock too. Bed capacity 1000 lb., CA 600 lb. Claimed dry weight 1,869 lb. 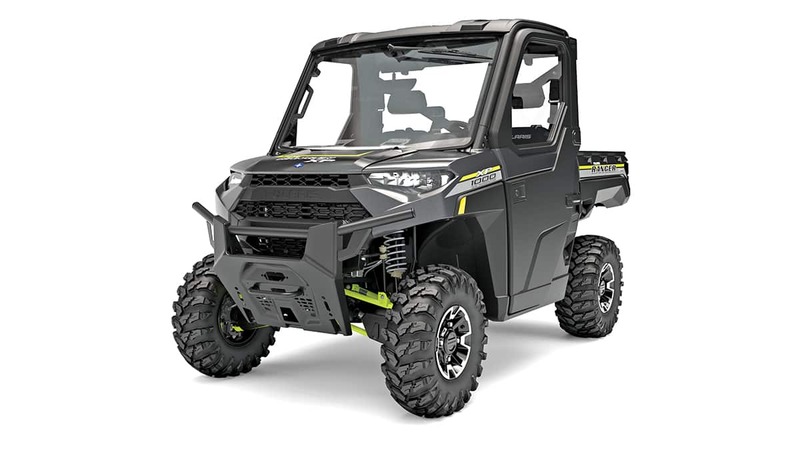 New: The six-seat X mr has locking diffs with Smart-Lok technology and mud mode, arched A-arms, high-placed CVT and engine intakes, aluminum rock sliders, and 30-inch ITP Cryptid mud tires on two-tone 14-inch rims. The high-placed 4500-pound winch has synthetic rope, and the 76-horsepower V-twin has three drive modes, and CVT with EBS and Hill-Descent Control. Claimed dry weight 2,006 lb. The 976cc V-twin has 11:1 compression and a Delphi EFI mated with a CVTech Trailbloc IBC CVT. The four-seat Sector Crew has plenty of elbow room and sports a plastic roof, split windshield, 4500-pound winch, H-D front bumper, side mirrors, turn signals, horn, LED headlights and a power dump bed with 1,00-pound capacity. It’s CARB/EPA-legal. Claimed dry weight 1,889 lb. The 999cc Unicam twin is mounted sideways in the chassis with a Dual-Clutch Transmission quickly grabbing each of six speeds plus reverse. The Deluxe adds trick aluminum wheels with 27-inch tires, LED headlights and color-matched side panels. The LTD adds i4WD with Hill-Side Assist and Electronic Brake Distribution, Fox QS3 shocks, aluminum skids and much more. Claimed curb weight 1,709 lb., P-5 1,396 lb. The Sage Green XP1K Crew EPS starts at $16,299, a $700 reduction. 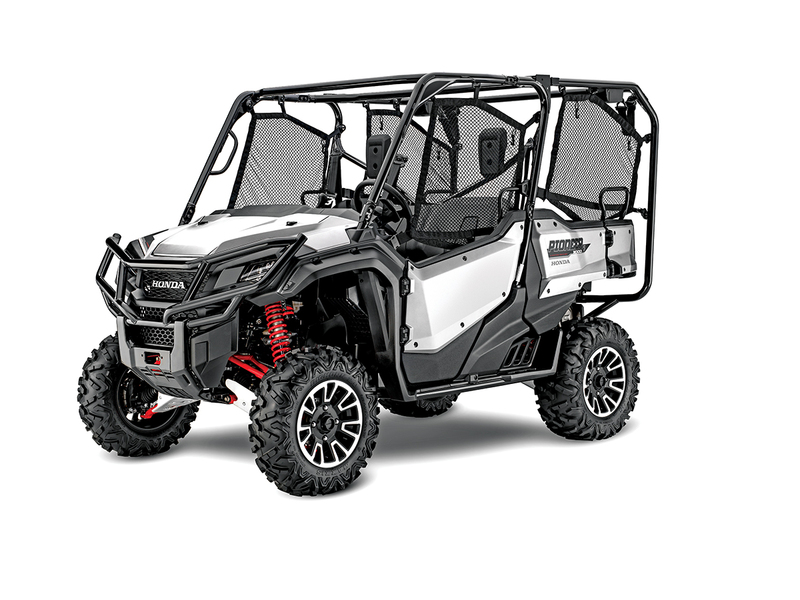 Or, get the Crew EPS with trick aluminum wheels and Sunset Red Metallic or Pearl White paint for $17,499 to Polaris’ Camo wrap for $17,699. All sport a 82-horsepower ProStar twin, 11 inches of suspension travel, and 27-inch Maxxis Coronados. The 20th Anniversary LE is Maroon Metallic with matching two-tone seats. Claimed dry weight 1,636 lb. Go big with six people in the Stealth Black High Lifter sporting mud-specific 28-inch Outlaw 2 tires, snorkeled intakes, front and rear bumpers, premium half doors with mud drains, arched A-arms for 13.5-inch ground clearance, and a color-matched snorkels, bumpers, shock springs and door drains. The 4500-pound Polaris Pro winch is for rescuing lesser vehicles. Claimed dry weight 1,587 lb. The 82-horsepower ProStar twin with alternator powers an industry-exclusive HVAC heating and air-conditioning system. The Crew has a fully enclosed Premium Pro shield cabin system with Lock & Ride glass windshield with wiper and washer, Lock & Ride glass rear panel, Premium manual-crank window doors, sport roof with liner and dome light and more. Claimed dry weight 2,032 lb. 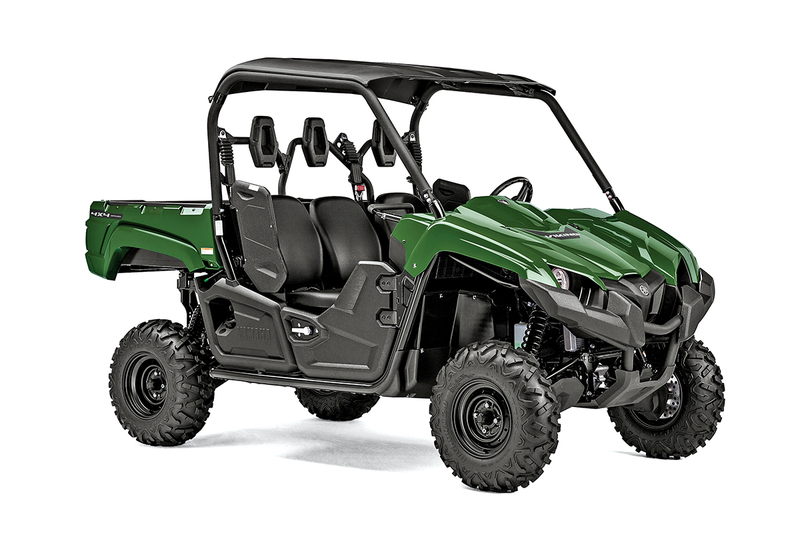 The six-person, 68-horsepower XP 900 Crew comes in Sage Green with steel wheels sporting 26-inch PXT tires, and it costs $13,699. The EPS Crew upgrades to variable-assist EPS and new Pearl White automotive paint or Polaris Pursuit Camo wrap. Crews sport the Versa-Trak unlocking rear diff and On-Demand AWD that unlocks for turns and locks for traction. Claimed dry weight 1,612 lb. ; EPS, 1,373 lb. The Stampede 4 has a 117-inch wheelbase with On-Demand AWD, EPS, dual torsion bars, 80-horsepower inline twin engine and CVT with EBS. The 4X upgrades to 27-inch Bighorn 2.0 on 14-inch split-spoke aluminum wheels. 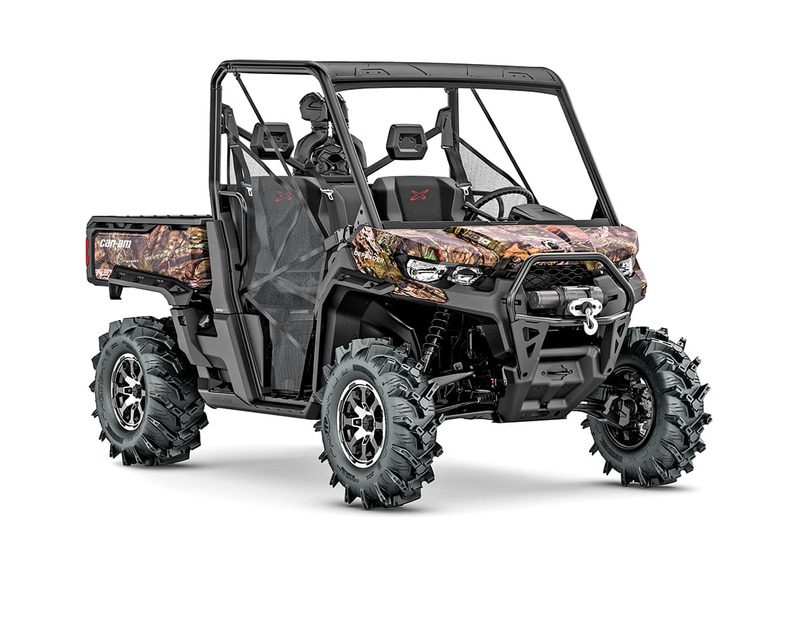 New: The Hunter Edition adds a hard roof, 4,000-pound Warn winch, and True Timber Strata Camo wrap to the 4X performance package. Claimed curb weight 1,690 lb. 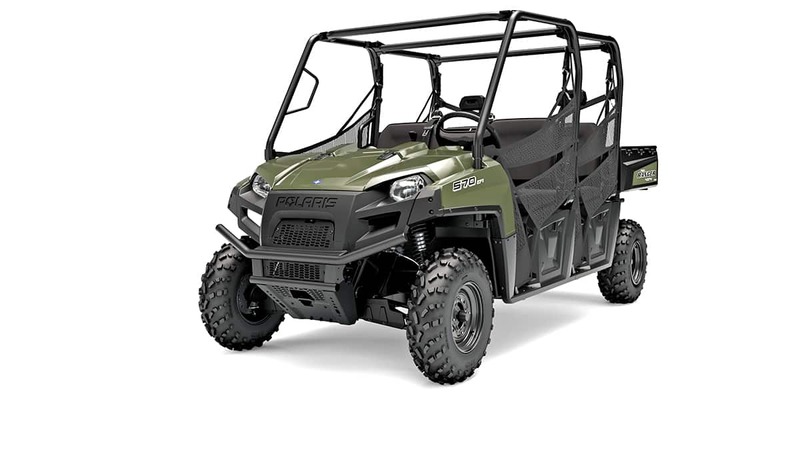 Wolverine X4s sport Yamaha’s first twin-cylinder UTV engine with off-set cylinders, short rods, dry-sump for low CG, special-cut gears and low shift points for quietness. Full-sized stadium seats stow forward for up to 600 pounds of cargo, and rear shocks are self-leveling for various loads. SE models upgrade to painted black or two blue color choices with graphics. Claimed curb weight 1,666 lb. ; SE, 1,666 lb. With an 812cc triple making 48 pound-feet of torque, the Pro-FXT has the grunt to carry three to six people with its convertible trans-cab. EPS versions add speed-sensitive EPS to the rack-and-pinion steering and a new Bright White color choice in addition to Timberline Green. 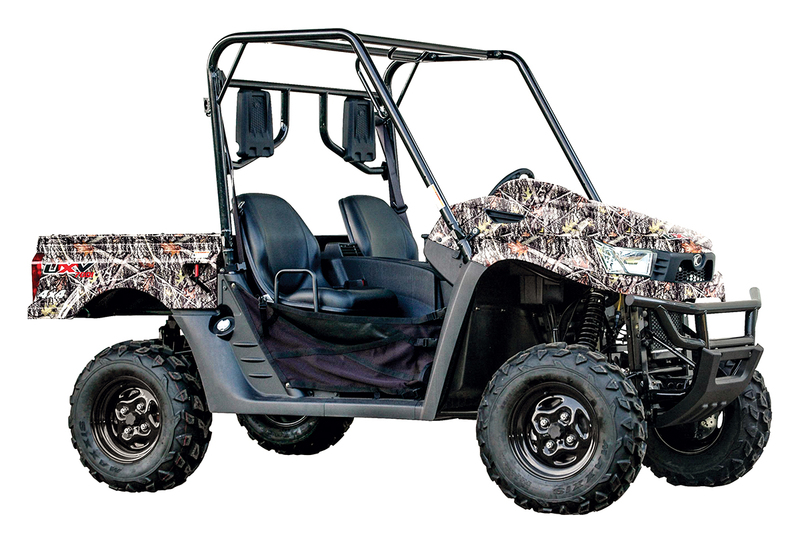 Or, go camo with Realtree Xtra Green bodywork; all have four drive modes—1WD to 4WD diff-lock. Transport up to six people or 1000 pounds of cargo in style with the FXT LE sporting Firecracker Red- or Super Black-painted bodywork, two-tone aluminum rims, a hard top and auxiliary LED headlights. The Ranch Edition adds Metallic Rustic Bronze, Ranch badging and seats, and a Warn Vantage winch to LE hardware. Claimed curb weight 1,992.8 lb. ; RE 1962.5 lb. Kawasaki also makes a diesel version of the new Trans-cab, the Mule Pro-DXT, which is actually lighter and less money than the FXT. The cabin converts from three to six in about one minute, and the DXT tows a ton and carries up to a half ton in the large steel dump bed. EPS DXTs add speed-sensitive EPS and two color choices, including new Bright White, for only $800. Claimed curb weight 1,923 lb. ; EPS, 1,936 lb. 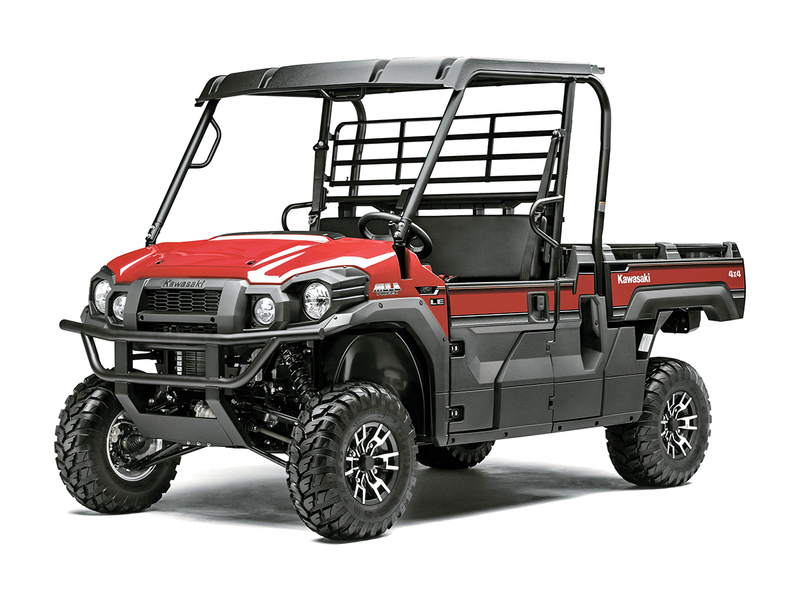 New: The Prowler Pro Crew sports a super-quiet 812cc, 50-horsepower triple and an unlocking rear diff for turf protection. It seats six, tows a ton and carries a half ton in its tilt bed. There is also 17.95 cubic-feet of storage and removable passenger seats. 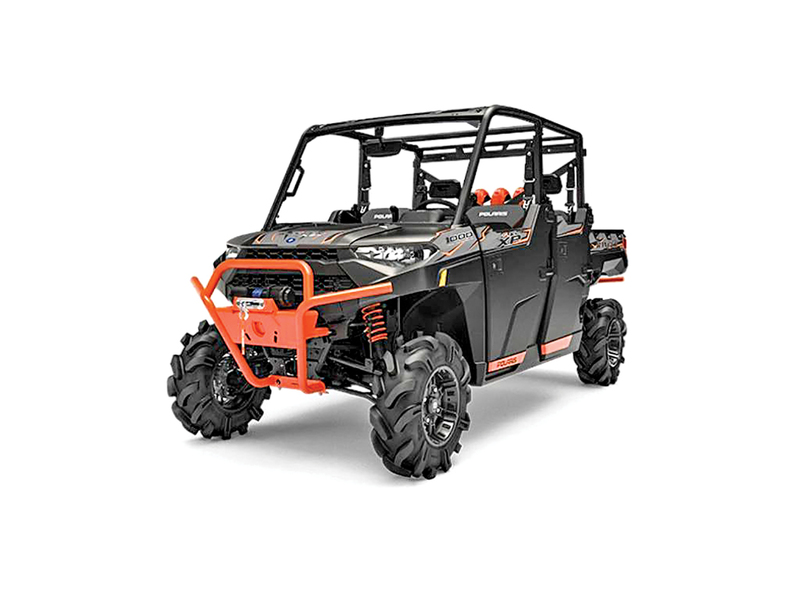 The Ranch Edition sports a roof, Warn 4500-pound winch, front brush guard and heavy-duty rear bumper. Claimed dry weight 1,856 lb. ; Ranch, 1,993 lb. The rear-mounted V-twin delivers 50 horsepower and 50 pound-feet of torque, and the Quick-Response Pro-Torq CVT has EBS, Hill-Descent Control and electronic belt protection. Six-person seating and lots of storage space in the dash and under the seats add versatility. HPG shocks and trailing-arm rear suspension deliver 10 inches of travel. DPS adds EPS with three assist curves. Claimed dry weight 1,675 lb. ; DPS, 1,710 lb. The 675cc single sits sideways in the frame for efficiency and is coupled with a Hondamatic three-speed transmission with automotive-style torque converter. The chassis also converts from seating for two to three or four with an innovative bed-tilt lockout safety system. Deluxe P-4s get EPS, paddle shifters, aluminum rims and new Diver Blue paint or camo. Claimed curb weight 1,396 lb. The Viking VI seats up to six and has crop-row width and an intake with one-year service interval. It’s powered by the old 686cc Rhino single with towing up to 1500 pounds and a 600-pound dump bed. 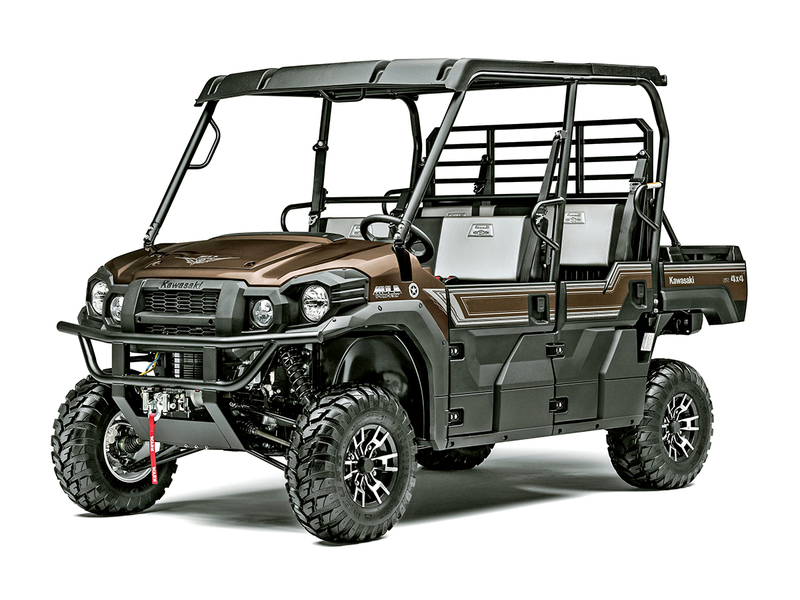 The Ranch Edition upgrades to Metallic Sand paint, matching interior, aluminum rims, roof, rear-view mirror, over-fenders, under-seat storage, bed grab bar and H-D front bumper. Claimed curb weight 1,695 lb. ; RE, 1,761 lb. Lengthen the Full-Size Ranger 570 to get the Crew 570-6 with seating for six and a 107-inch wheelbase. A Versa-Trak unlocking rear diff aids turning and turf protection with the Polaris On-Demand AWD system. MacPherson strut front and independent rear A-arm suspension is tuned for a plush ride with 10 inches of travel, and the ProsStar single makes 44 horsepower. Claimed dry weight 1,392 lb. The kid-sized Crew 570 carries up to four with a 105-inch wheelbase and On-Demand AWD with an unlocking rear Versa-Trak diff. The Crew 570-4 has the same 44-horsepower single and suspension as the 570-6, but has 300 pounds less bed capacity and less ground clearance. It does have an option for variable-assist EPS and Nara Bronze paint for $1700 extra.